As I said in an earlier post, I recently had the good fortune of traveling to Paris to meet up with my sister and to visit some good friends who are living there. I have been enjoying doing watercolors of some of the photos I took. 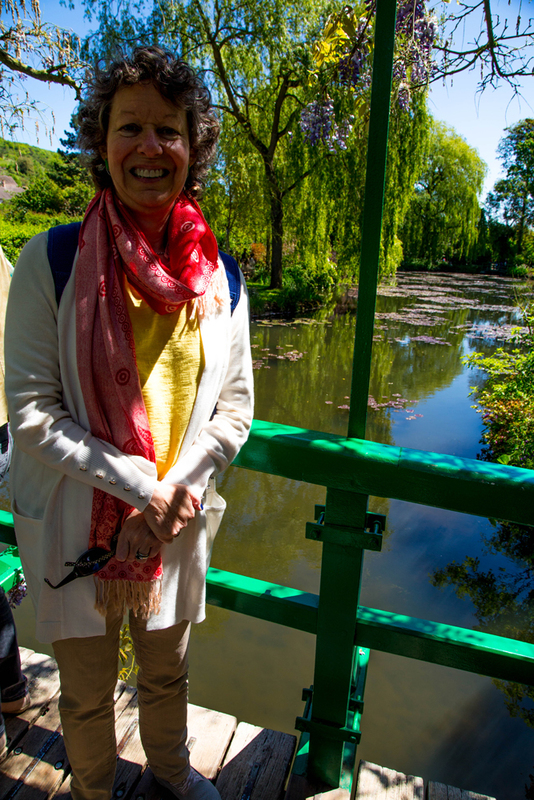 One of the things we did while I was there was visit Giveny, where Monet lived out the later part of his life. 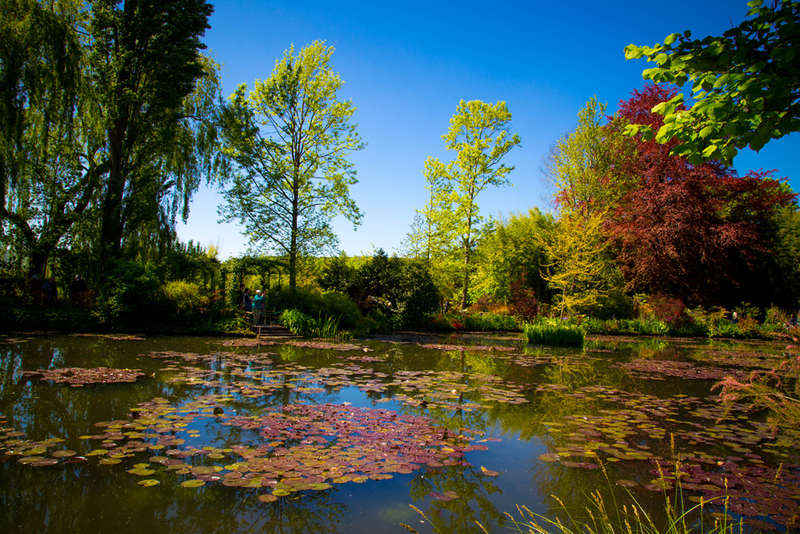 We visited his home and his spectacular gardens and famous water lily pond. This was on my bucket list and it was every bit as magical and inspiring as I had hoped. I expect to be painting from the photos I took for a very long time. Below is a shot of the garden followed by my watercolor interpretation. I tried to capture the bold color of the sky and it’s reflection in the water. It took two attempts to get this. I’m still learning the watercolor process and the approach to painting. 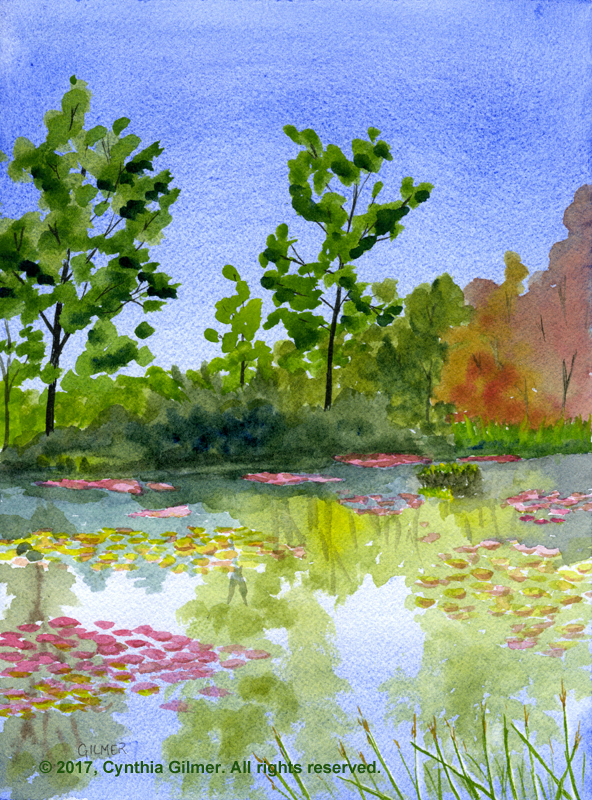 I after a blue wash I painted the lilies followed by the water reflections and then the trees in the background. That seemed to work well. Here is a photo of me in the garden standing on one of the famous bridges looking and feeling awestruck. 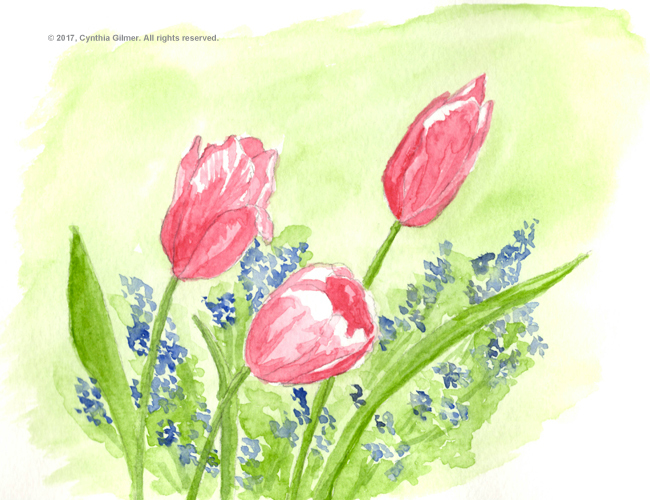 I’ve been trying to do some watercolor sketching of the many flower photos I took. Here are two from my sketchbook. 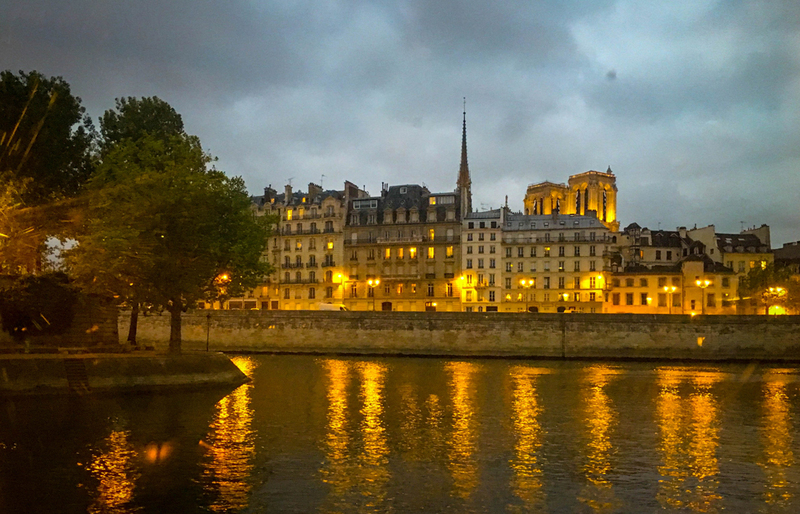 Finally, I took some lovely photos of Paris in the evening while on a dinner cruise. I only had my iPhone with me, but it does have a pretty good camera and is quite good in low light. I have attempted a watercolor cityscape from one of these photos. Unfortunately, I don’t think I captured the evening light well at all. 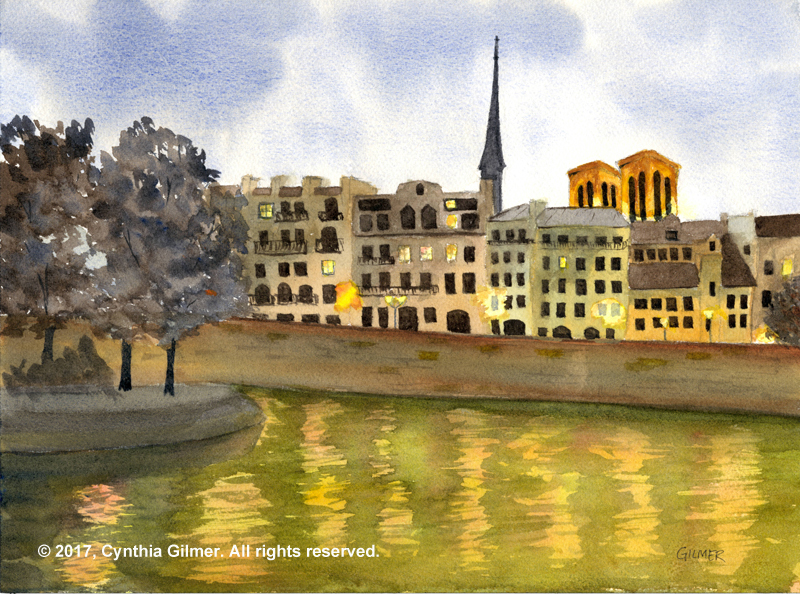 It’s hard to get the richness of the colors as night falls in watercolor. This one begs to be done in oil, so I am going to do that soon. I will post when I’m done. I’ve been absent for a bit. I actually have several posts I need to write, including one on my trip to Paris that included a trip to Giverny, but for now a quick update. 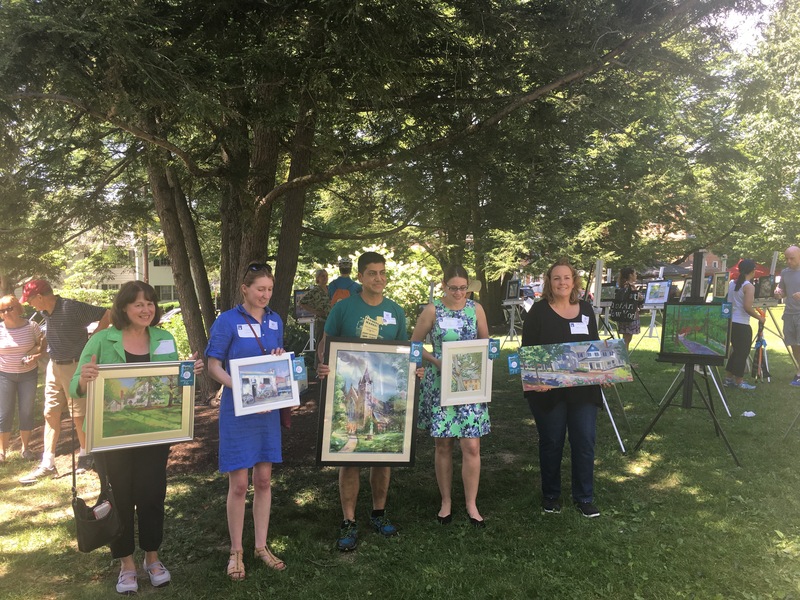 This weekend was the judging of the 8th Annual Falls Church Arts Plein Air show. I was only in town to paint two weekends for the timeframe of the show (mid-April to mid-June). One of those was cold and rainy, the other I agreed to gallery sit at the new gallery. I got creative and sat out in front of the gallery and painted Kensington Corner. The finished product was only minimally realistic because I only painted what I liked. I painted the clock and the bus stop and the trees and flowers, but not the roads and only minimal detail in the buildings. 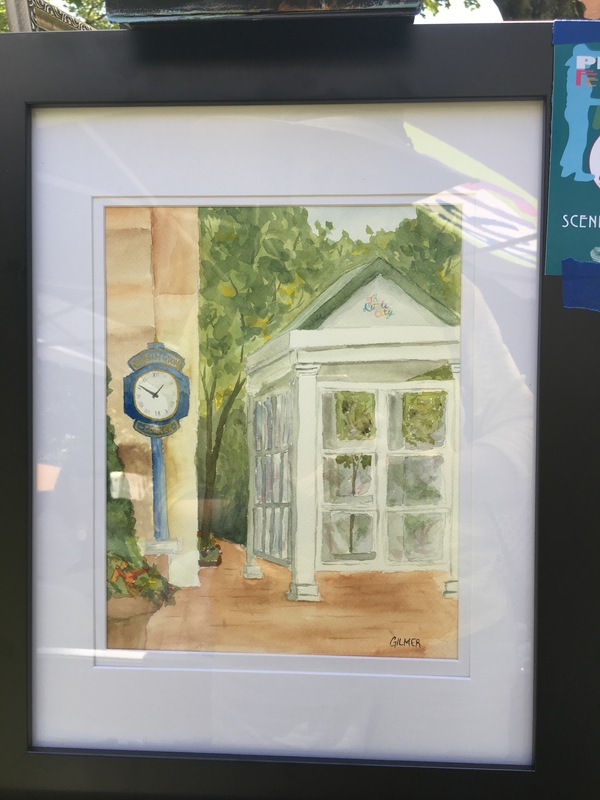 I kind of liked the result, and so did someone else, because the painting sold at the showing on Saturday. It was bought by a lovely couple who very thoughtfully viewed the show and chose two paintings to buy, one being mine. I hope they get many years of enjoyment out of it. I have been so busy that I framed the painting in haste, and did not scan or photograph it. I will need to remember it from the iPhone photo I took of it in its frame. This show has several cash prizes. I did not win anything, but below are the well deserving and very talented winners.